Was trying to download spot exchange rates on to excel and see its intra-day movement. 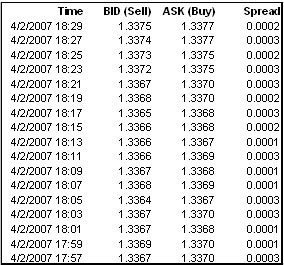 The exchange rate markets are pretty volatile and it’s tough to track it by copy + paste every now and then. So this does the job. 1. Click on one of the cells in the worksheet and go to Data -> Import External Data -> New Web Query. Learnt about this feature recently and found it damn useful every time data needs to be copied from the webpage (works only on those which don’t require user-authentication). 3. Set the whole thing under macro and wanted this to refresh data every 2 minutes (people who are in Forex trading might think otherwise that it would prove costly to check every 2 min, they wouldn’t blink for a second not to miss the quote) and insert new set of data for every tick. All you would need is set the timer for the macro so that it runs at every 2 minutes. 4. And here is the output I needed.